In the post below this, I mentioned I washed the living room rugs. Pilchard made a "deposit" of a hairball on each. There was also winter grit and dirt and this stuff called black hair all over the rugs. I'm kind of interested to see how long they stay reasonably clean. With the thaw occurring, I'm starting to track in some mud. It will be much worse in the next couple of weeks. But, let's conduct an experiment and see, shall we. 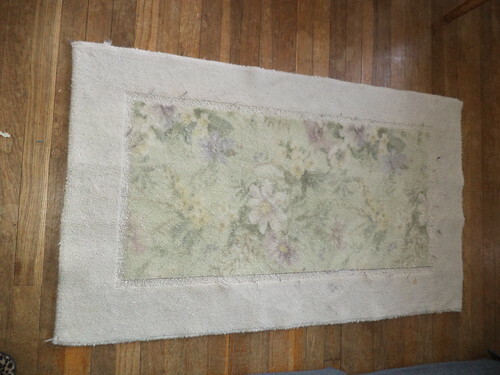 This is the rug that sits in front of the recliner. It's a floral design on cream. 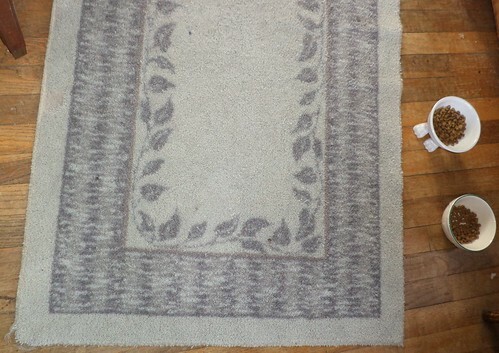 This rug used to be cream color but I put it in the wash with a blue bath rug. Yeah, you'd think I'd know better. Pilchard loves this rug. I put it down on the floor and, 3 hours later, heard this commotion in the living room. When I came into the living room, she had it all balled up from attacking it and looked happy as a clam. I know I have asked this before what it is about this rug that cats in my household love to attack it. The rugs were down on the floor on Saturday and they still look as clean as they did on Saturday. I have taken my shoes off in the kitchen if I suspect they are muddy. So far, they haven't been. Four days and counting.